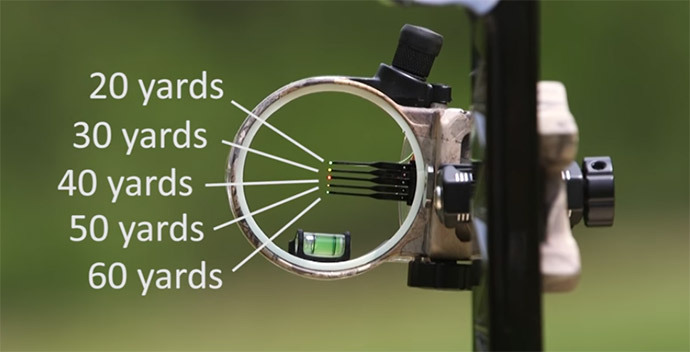 After extensive research and firsthand experience on different bow sights during numerous hunting trips, I am able to determine what bow sights work best in different situations. CLICK TO READ MY REVIEWS! One of the basic questions you have to ask yourself before going on a hunt is what type of bow sight should you use. This decision can greatly affect the accuracy of your shots, and as an extension, the outcome of your trip. I have tried using both a single pin sight and a multi-pin sight for past hunting trips. Today, I’ll discuss the advantages and disadvantages of using each one, then I’ll give steps to help you decide the best bow sight for you. Step 1: Single Pin Or Multi Pin Bow Sight: Which One Is Better? ﻿﻿Step ﻿﻿2: How Many Pins Should You Use? ﻿﻿Step ﻿﻿3: What Sight Pin Diameter Is The Best Choice? Bonus Step: Sight Bar Length. Step 4: What’s A Good Bow Sight For Hunting? First, we have to differentiate what a single pin sight and a multi-pin sight is. A single pin sight (also known as a moveable slider pin) can be adjusted depending on the yardage of the game. On the other hand, a multi-pin sight (or fixed pin sight) has a set of pins, usually 3 to 5, stacked at increments of 20 to 60 yards. Because the single pin sight has only one pin, it provides less clutter. I believe this is advantageous because you don’t have to work through any distractions, and you can focus quickly on your target. The presence of 5 to 7 pins in your sight may cause blind spots that affect your view of the game. This, in turn, will affect the time it takes for you to focus, which could then make you miss an opportunity to shoot. When you use a single pin sight, you have to manually adjust your sight before you can shoot your target. The upside of this is that you can set the sight at the specific yardage (e.g., 36 yards instead of estimating between 30 and 40 yards), allowing you to be more accurate in your shot. Most multi-pin sights have pins that are set in increments of 5 or 10 yards. This means you have to estimate the distance between yourself and the game and decide which pin is most appropriate for the situation. If you choose the wrong pin, you might alert your game and cause it to run away. With a single-pin sight, you have to readjust your pin every time your target shifts positions, or you have to make a quick guess on your shot. The latter has a disadvantage of alerting your game, causing it to run away before you can even finish adjusting your pin. Many hunters prefer to use a multi-pin sight because it makes hunting quicker and easier. Because you have already set up your pins before you go on your hunt, you can easily choose which pin to use, depending on how near or far your game is. If you suffer from buck fever, or if you have a hard time counting down on your pins, or you have problems with pin gaps, then it might be a smart move to use a single pin sight. If you don’t have trouble with any of these, then a multi-pin bow sight could work for you. While many multi-pin sight users complain that it’s tedious to adjust the pin in the middle of a hunt, Tony reassures us that this is not always the case. Most of the time, you don’t have to adjust your sight, but just carefully lift or lower your bow a few inches, depending on the yardage. One advantage of multi-pin sights is that you don’t have to think too much about the yardage before making the shot. You can draw your bow, quickly decide which pin to use, and then shoot. With a single pin sight, you have to decide your yardage before drawing the bow. The important thing is that you need to be honest with yourself before choosing which sight to use. Assess your shooting ability, and use a sight that fits your style better. This will definitely save you a lot of trouble during your hunting expedition. Step 2: How Many Pins Should You Use? If you opt to use a single pin sight, you can skip this step and go straight to What Sight Pin Diameter is the Best Choice? As its name suggests, a single pin sight uses only one pin, which you can adjust depending on the distance of your target. If you decide to use a multi-pin sight, it is essential that you use the correct number of pins. Three pins - If you want to shoot between 20 to 40 yards, then three pins is a good number. You avoid adding unnecessary clutter in your sight, but still have enough pins to switch around, depending on the yardage of your game. Five pins - Five pins work best if you plan to shoot game from up to 60 yards away. Set your pins in increments of 10 yards each, starting from 20 yards and ending at 60. While finding a good target from 60 yards away is a rare opportunity even for seasoned hunters, five pins are handy when you need to make follow-up shots on a game that you’ve already hit. Seven pins - Not many bow hunters use seven pins, but you can use this if you plan to shoot from 80 yards away. You probably won’t have many chances of shooting game from 80 yards or more, but you can use this chance to correct your form so that you’ll be more accurate when shooting from shorter distances. Using a smaller number of pins might make you miss an opportunity of shooting a target that is farther away than your set yardage. On the other hand, using a bigger number of pins might add unnecessary clutter to your sight and affect the visibility of your target. Step 3: What Sight Pin Diameter Is The Best Choice? Once you’ve chosen the type of bow sight and decide on the amount of fiber you’ll use, the next step is to choose your pin size (or pin diameter). Pins come in different sizes, and the success of your shot largely depends on using the right pin diameter. The most common sizes are .010”, .019”, and .029”. Light transmission - The smaller the pin, the less visible it is in low-light surroundings. On the flipside, the bigger the pin, the more visible it is. Since most hunts happen at early dawn or late at night, the right pin size is crucial so that you don’t miss your target in the dark. Also, a hunt can take you to a deep part of the woods where little light seeps through. In these situations, big pins will keep their light longer than small pins would. Fiber length - A longer fiber strand often means more light absorption. Remember that your fiber traps light and transmits it to the end of your pin, so the longer your strand is, the more light you catch. However, make sure that there are no breaks in your strand because this disrupts the transmission of light to your pin. Precision of aim - If you have a smaller pin, your aim will be more precise. Big pins have the tendency to cover more parts of your target, so you have a bigger blind spot to work around. How precise you can aim your arrow will greatly affect the success rate of your shot. Eye distance - Your view of the pin changes depending on its distance from your eye. If you have a long sight bar, your pin may look smaller than it really is. Conversely, if you have a short sight bar, your pin may appear larger than its actual size. When choosing a pin diameter, it is very important to consider how precise you want your aim to be. Remember: The smaller the pin, the more precise your aim becomes. For regular-light environments, I find that I can already make precise shots with a .019” pin. While a .010” pin will help you have a more precise aim than a .019” pin, it’s harder to use at night because it loses light quickly. On the other hand, a .029” pin, while remaining visible for a longer time, has the tendency to cover more parts of your target, so you have a bigger blind spot to work around. In most cases, a longer sight bar lets you shoot more accurately because the sight is farther away from your eye. The closer the sight is, the more area the pin will cover, which might affect your aim. However, a shorter sight bar allows you more movement when you’re in tight shooting spaces. A good bow sight should be easy to use. If possible, get a bow sight with a microtune feature, which makes adjustments fairly easy. There are bow sights with no microtune that are also okay, but you have to manually adjust them with a wrench every time you use your bow. A microtune allows you to make very minute adjustments to your sight by simply clicking the side controls, one click at a time. This speeds up the process of adjustment, giving you more time to focus on your game rather than your equipment. A good bow sight helps you make accurate aims at your target. This goes hand in hand with choosing the correct pin size to use. However, remember that the right pin size is not enough to make precise aims. Your bow sight must also be aligned properly, and its shape should be the right sight shape. This may not mean a lot to other hunters, but I want my bow sight to be as light as possible. After all, this will add to the overall weight of my bow. The bow’s weight determines how much effort I need to make when carrying and drawing my bow. 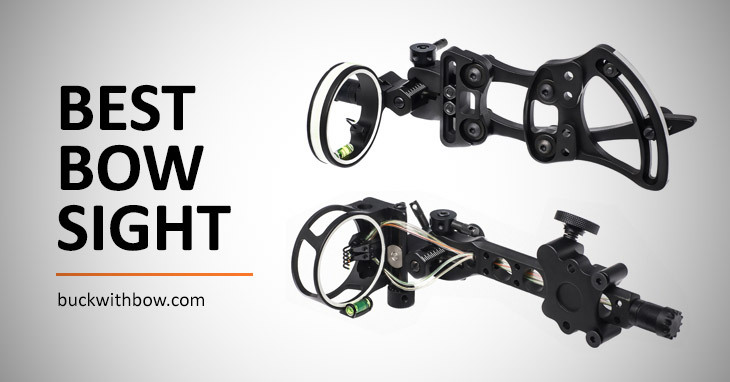 You will want properly engineered controls for your bow sight. Steer clear of sights that have noisy adjustment settings or those that produce a soft “click” every time you make a small recalibration. Remember: While the softest sound may seem insignificant when you’re testing the sight in the archery shop, it could mean the loss of a potential prize in the actual hunt. I want a bow sight that is tough and durable, especially when I go on long hunting expeditions. This is very important, because I don’t want any part of my bow broken while I’m going after a beautiful white-tailed deer. Avoid bow sights made of plastic because they break easily. Always choose a sight made of metal (aluminum is okay for beginners), because metal can withstand harsh outdoor conditions that you might experience during the hunt. High-quality bow accessories do not come cheap, but they are generally more cost effective in the long run. A cheap bow sight might save you money, but it could ruin a good game if it breaks while you are in the woods. It is often better to invest in a good bow sight that costs a bit more than waste money on an inexpensive brand that you need to replace after one or two uses. Both sight types have their advantages and disadvantages, and you have to be honest with yourself so that you can make the right decision when choosing which one to use. Whether you’re a single pin or a multi-pin sight user, remember the steps and guidelines I’ve listed above. 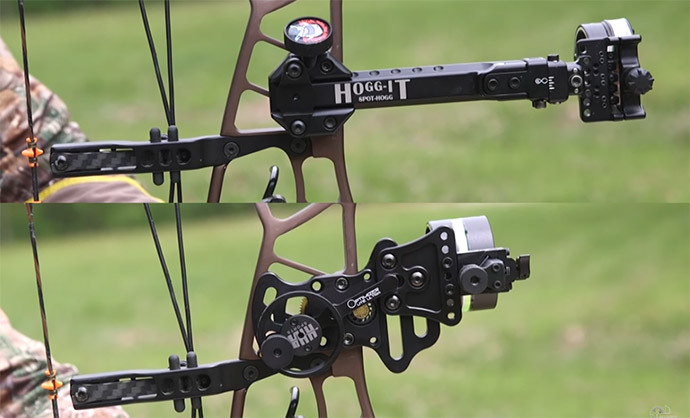 These will help you choose the best bow sight for your hunting needs.